This is old version Doodle Army 2 : Mini Militia 2.2.52 apk for Android, you can install it if you want to downgrade or install old app. It is top Action apps from Appsomniacs LLC. In order to be victorious on the game, you will need a good strategy. You can use in-game equipment and armor to make your character stronger. It will increase the chance of winning the battle significantly. 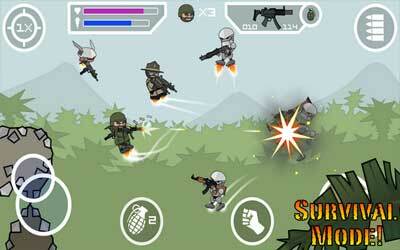 Heavy duty weapons and artilleries are added to support the game play to be more challenging. The game is integrated to Google Play Game. Besides multiplayer feature, it also has achievement feature. If you complete certain task on the game, you will achieve particular objective. This achievement will give you rewards. The rewards might be different between the achievements. Moreover, it also has leader board system which allows you to know who the best player is. In addition, the game play is also challenging and addicting. It is designed to provide entertainment for its users. However, Doodle Army 2: Mini Militia for Android has major downside on its graphic that’s a big deal for some gamer. Doodle Army 2 Mini Militia aka DA2, based on the original stickman shooter Doodle Army, was created based on player feedback and suggestions. We love to hear your ideas so thank you and keep them coming! Give a call out to Sarge from the in-game email link!